The fall season is here and everyone knows what that means: leaves change color, sweaters become a choice fashion, pumpkin spice lattes are in, and little demon children run around shouting, "Follow me, daddy, follow me!" At this point, you might be confused, saying to yourself, "I, for one, don’t care for pumpkin spice lattes." Fair enough. Let me try that one more time. The Halloween season is here, and you wake up from a creepy nightmare to find yourself in a creepy prison. Your head is pounding, like really pounding, so much so that you hear and feel every single time your heart beats. You wander around a prison, wondering what happened — how did you get there? Why are there books of demology, and scattered Bible verses written on pieces of paper. That’s not how your Halloween season typically starts? Well, it can be, with Inmates, developed by Davit Andreasyan. 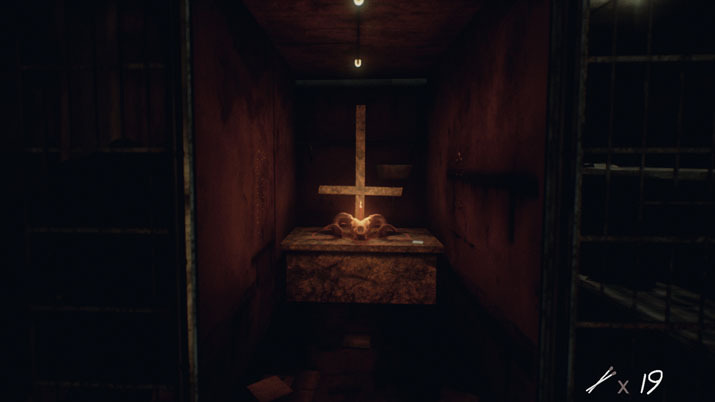 Inmates is a brand new psychological horror game that does its job of scaring you, and does its job well. Sweet Dreams are Made of This...? Your experience with this game begins not in the gameplay itself but in the menu screen. Upon clicking the start button, a loud swinging door opens up — which may or may not scare you — and you are dropped into what could be accurately described as the pit of I-think-I-lost-all-my-sanity-and-really-don't-want-to-play-this-game-alone. Alas, everyone has been in this pit before with one game or another. The title starts off with the horror classic of "how did I get here?" You are left alone in a desolate cell, free to wander around the prison, and further. 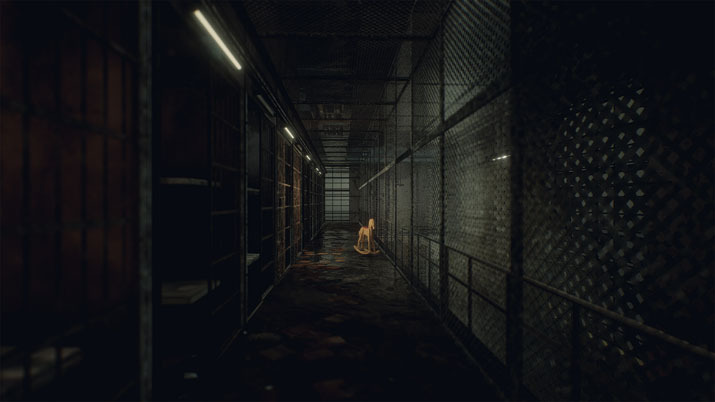 Inmates is described as such: "...a story-driven, atmospheric psychological horror game. Featuring interactive exploration in a suffocating location, mind-bending puzzles and disturbing imagery." What more can be said? As you try and figure out how you got to your current situation, you are treated to puzzles, making the game more than just a jumpscare simulator. There are plenty of places to go and plenty of things with which to interact, such as the fine literature of a child's diary that makes the hair on the back of your neck stand. Lovely, no? The sound design in this game is top notch, captivating you with each heartbeat, each footstep, and each child running through the halls telling you to chase him or her. By no means is there cheesy, looping music that takes you out of the game; rather, every sound enhances the experience, making it feel full and immersive. At some moments, it’s quiet, and you’re afraid as to why; other times, you hear footsteps and you're uncertain if they are yours or someone — or something — elses'. Whatever it ends up being that scares two years off your life, it sounds realistic doing so, and may instill some paranoid headphone removal to be sure it's not coming from behind you. The world in which you have the unfortunate pleasure of being trapped is well detailed and eerie. Even though the grimy universe has demons running around, it's a nice one that you can appreciate when you are not screaming or playing the game, but more so looking back, outside of the chaos. The only shortcoming would be the camera movement. At times throughout your playthrough, your camera will be directed to focus on some event, and it feels a little clunky when doing so. Inmates grabs you right off the bat and starts yelling in your face: you are screaming and afraid, but at the end of it all, you’ll probably tell your friends that they need to come over and get yelled at, too. The story unfolds before you as you scramble to find matches to see through the darkness, and you are captivated. You feel a mix of emotions, fear being the most prominent. You want to stop playing because you are unsure if your heart can take one more fright, but you continue on because it is truly that fun. Besides the game world being well designed, and the sounds making you check your shoulder every few minutes, the creativity and the puzzles keep you on your toes as you try to navigate through the world. It is more than just a creepy game you walk through and hear or read a story. It's an experience to die for.